Ciao Pittsburgh is proud to announce that we now have our own premium Italian seasoning blend called, Aroma. I would like to first say thank you to my Ciao Pittsburgh team—Daniel Casciato, Nicky D Cooks, Jeff Fanala, and my brother Jay—for pushing me to do something that I have always wanted to do. A wonderful opportunity arose and I took advantage of it with their full support. Thank you also to Dave and Deb from Savvy Spices as well as to everyone who follows our Facebook page, our online readers, and our wonderful sponsors, Birra Moretti, The Cigar House, The Leaf and Bean—McMurray Location, and Allegheny Smoke Works. Thank you to those of you who truly believed in me and those who support me the most especially my parents, my family, my brother and his family, and of course, my wife and my children. For those who know me very well, you know I don’t do anything less than 100%. I work hard until I get my projects or my goals to exceed to an exceptional level. You can say that I’m a perfectionist and simply want the best. So what about this new seasoning? Well, first, Aroma is comprised of high quality ingredients. Since we wanted to accommodate most people’s needs, we decided to do a salt and salt free version. This Italian seasoning is great on pasta, salads, eggs, pizza, dipping oil, veggies, chicken, fish, pork, beef or anything you want to give an exceptional flavor to. Let’s face it—anyone can mix garlic, oregano, basil, and onion together and make something taste “Italian.” I wanted to take it a few steps further and put my own special twist to it. I guarantee you that Aroma is something you have never tasted before. Our slogan is ”Old World Feel, New World Flavor.” Why? Because it is. I wanted to break away from overused cliches. I came up with the name Aroma after kicking around a few names. But once I finally received my sample bag, the aroma that wafted from the bag without even opening it convinced me that Aroma was the right name.Before, during and after cooking, your house will smell like no other! The smell of Aroma alone will make you run to the kitchen because you can’t wait to start cooking just so you can add this to your food. 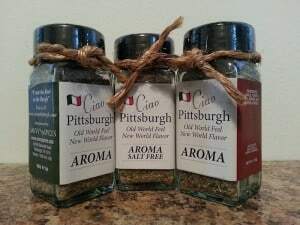 I am very proud of this product and in my opinion, another product from Ciao Pittsburgh that is exceptionally made. I hope that you support us and purchase a bottle. Tell your friends and family to share it on your Facebook pages and be sure to send us recipes when you have used it. And of course, send us photos that we can share! Aroma consists of garlic, bell pepper, tomato, salt, herbs and spices. Part of the greatness is the mixture, but the other part is the high quality and freshness of the ingredients. It tastes like you went into your garden and cut fresh veggies, herbs, and spices and cooked with them. Give it a try—I promise you won’t be disappointed. I would also like to give special thanks to Donatelli’s in Bloomfield, Groceria Italiana in Bloomfield as well as Savvy Spices on Banksville Road for giving us the opportunity and allowing us to add our product to your stores. We are working on agreements with other local businesses. Once our product is on display in those locations we will add them to our page. Aroma’s price is $6.00 per 1.7 oz. bottle.